Concept of sub queries, with explanation and example. Concept of correlated sub queries, with explanation and example. 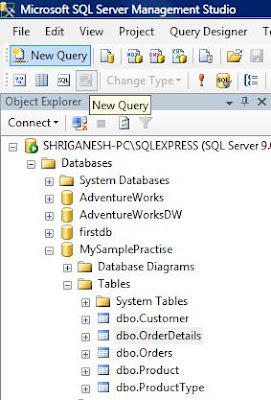 For execution of Query, Open New Query Editor as shown in figure. 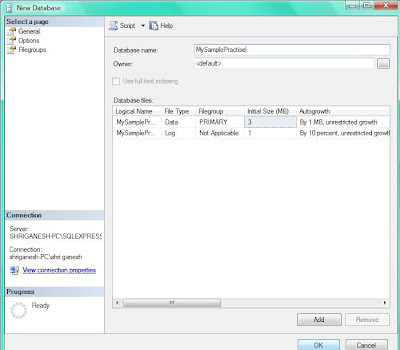 Now lets execute different data manipulation statement. For mastering, Data Manipulation from beginner to expert, Study following Example with 150+ Queries. Filtering Records with "Where Clause"
--You can replace above statement by using Between statement. --Between will show customer with customerID 1003 to 1008. --Note: by default when neither ASC (for Ascending) or DESC (for descending) is specify, it is ordered in Ascending order. --Display Customers of USA country ordered by state in descending order. 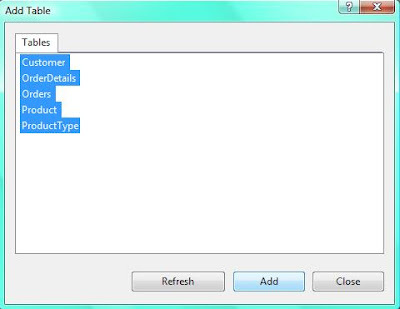 --Order Customer by LastName in descending order and FirstName in Ascending order. --Display Count of Customers country wise and display those countries only where more than 2 customers are available. 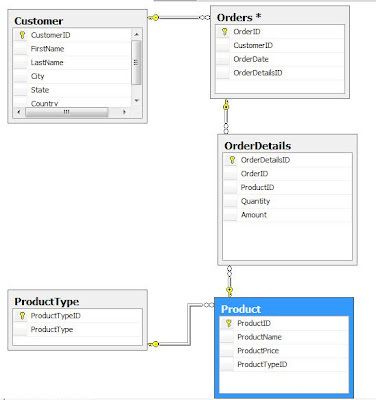 Using both Where and Having Clause to Filter data. --It will display only Customer Count from "NJ" state of "USA" country. --Display Count of Customers from country "USA", state wise and it should display details in descending order of state of those state where Customers are atleast 2. Now, lets display data from multiple table. For that we need to understand Joins so lets begin what is Join and how many different ways to display data. 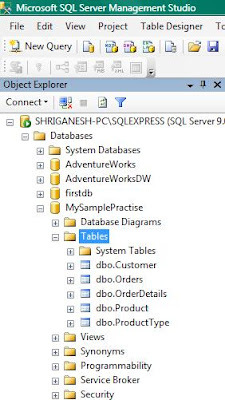 Joins in SQL are used to combine the data from two or more tables on a common column between the two tables. Lets go through the concept quickly. Inner Join return those rows which are common in both the tables. In other words, Inner Join displays only the rows that have matching rows in both the tables. Note: Nulls are excluded. Another thing you may even write just "Join" instead of "Inner Join" as default join is "Inner Join"
Both query will be generate the same result. --Display Details of Customer who have placed order. --or-- Note: Inner join is default join and so you can write just join instead of inner join. --Display Details of Customer living in "USA" who have placed order and arrange data by latest order placed. Left outer join returns all the records from left table and only matching records from right table. Right outer join returns all the records from right table and only matching records from left table. A cross join returns the sets of records from the two joined tables. If A and B are two sets then cross join = A X B. A table is join to itself in a self join. 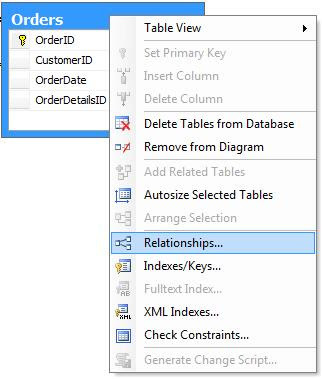 In joining three or more tables, join applies to only one relationship, and each relationship represents an association between only two tables. The first join applies to table1 and table2, the second join applies to table2 and table3. --Display details from customer, order and orderdetails table. A query within another query is called sub query. --Display details of customer belonging to "NJ" state of "USA" country has placed order. --Display order information along with amount of order. where o.orderid = od.orderid) as "Amount"
--Display orderdetails along with product details. 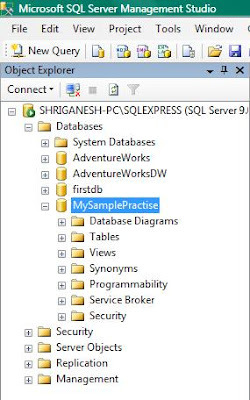 where od.productid = p.productid) as "Amount"
First of all logged in to SQL Server 2005 Database with Administrator rights as most of the stuff we gona do require admin rights. 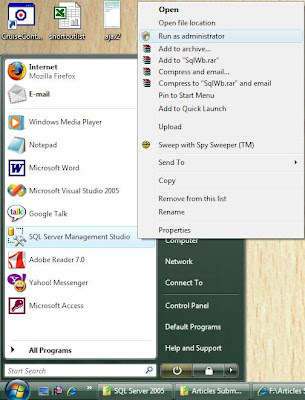 Right click Database Folder and click Database as shown in Figure. So our "MySampleDatabase" Is created. 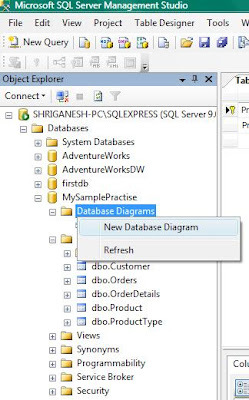 So after creation of Database it consist of various database object as shown in figure. Here, CustomerID is Identity field, that is Auto generated by system. It is similar to AutoNumber field in MS Access and Sequence in Oracle. Identity Increment - It is number of increment you want from the previously generated ID, here i have taken 1. 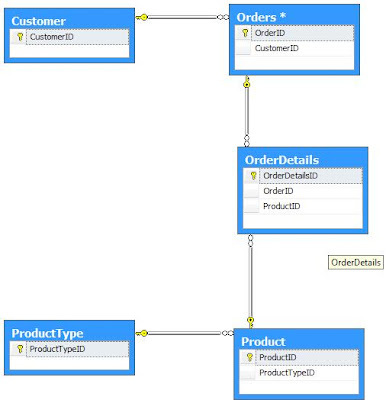 Constraint is a check which is made on table which must be followed by user entering data. It reduce the number of Invalid data feed-in into system by prechecking its validity. In this table 2 constraint are used that is "Allow Null" and "Primary Key"
Allow Null Constraint - If checked than will Allow Null values in field, else it will not allow you to bypass the column without entering data. 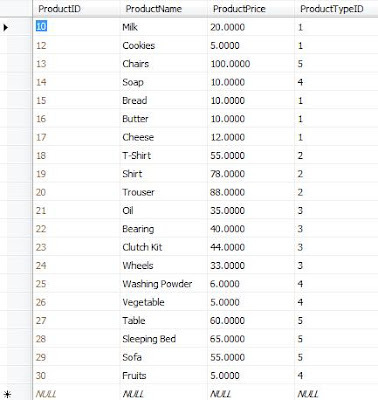 Now in similar fashion create Order Table, OrderDetails Table, Product Table, ProductType Table. 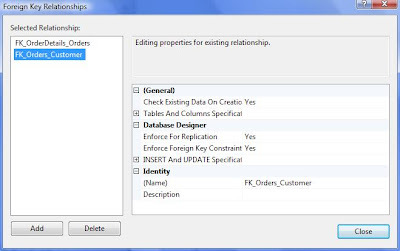 Right click the "Many" Table as They don't allow to change foreign key table in Releationship dialog. Foreign Key Relationship dialog box will appear, press add button and you will find details appear on right pane of dialog box. 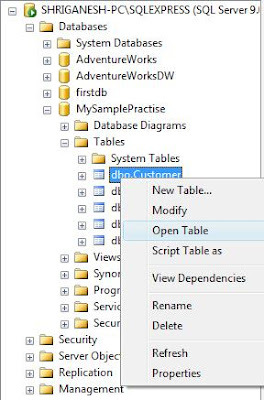 Now click the open dialog button on right of "Table And Columns Specification" from right pane of dialog box. For creating relationship between Orders and Customer, CustomerID is used. 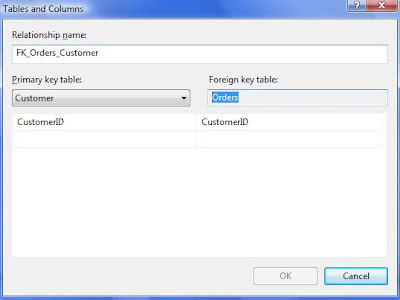 Select Table "Customer" for Primary Key Table and table "Orders" for Foreign Key. And press ok button to create relationship between two table. It will not allow to enter orders details without customer information. That is it allow to enter orders details of valid customer. It will not allow to delete customer information, until all details associated with customer is delete. You may change setting as per your need by selecting No from dropdown of "Enforce for Replication" and "Enforce foreign key constraint"
Similarly you need to create relationship between remaining tables. 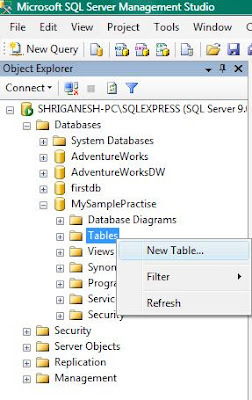 When you are dealing with large database with 100's of table, you can change the view of table by selecting all table with "ctrl+A" and right clicking any of selected table and change its views so that it is convinent to view. 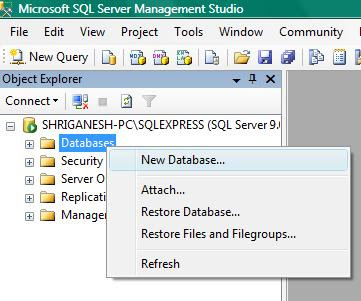 Inserting Record in Table for SQL Server 2005, right click the table and select open table, it gives you MS Access type editor to enter data. 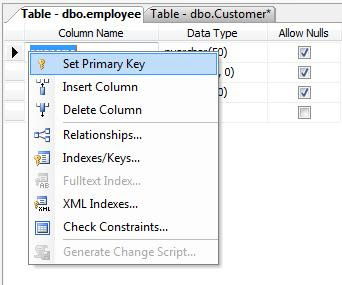 Note those who prefer inserting data through SQL Query or Script may open SQL Editor. 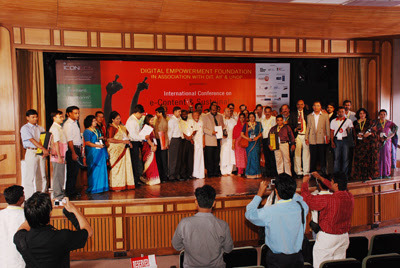 Similarly making change in table design click modify. Now key-in the data in customer table, as shown in figure. Note: here CustomerID is generated automatically and its value is starting from 1001 as we have set Increment Seed to 1000. Insert Record into Customer Table. Similarly enter data for other tables. 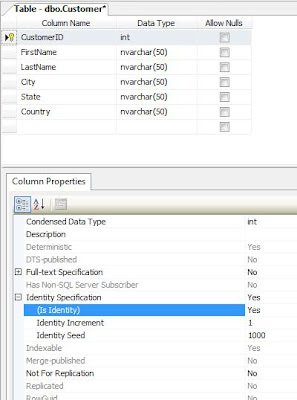 Remember, you don't need to enter data into CustomerID, as it is Identity field wherein data is auto generated by system. As we have enforce Referential Integrity by creating relationship, so you are not allowed to add record in orders table with anonymous customerId.